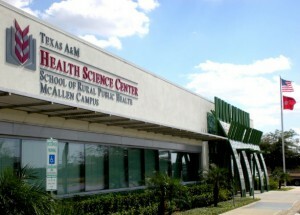 Before the winter break, Ms. Angie Alaniz, CCHD Administrative Director, and Ms. Katy Nimmons, Director of CCHD’s National Community Health Worker Training Center, traveled to the School of Public Health (SPH) campus in McAllen. Katy spent the week with SPH and AgriLife faculty and staff who have partnered to implement the “Working on Wellness” (WOW) project in Hidalgo County. Angie joined Katy later in the week to meet with University of Texas Rio Grande Valley officials to discuss a potential joint project. The WOW project will focus on improving access to healthy foods and developing safe, neighborhood options where Hidalgo County residents can be physically active. The project, funded by the Centers for Disease Control and Prevention (CDC) in October 2014, is led by Principal Investigators Dr. Marcia Ory from SPH and Dr. Carol Rice from AgriLife. The project aligns with CDC’s aim to reduce chronic diseases, promote healthier lifestyles, reduce health disparities, and control health care spending. The WOW team met in McAllen to lay the foundation for project planning, implementation, and evaluation. Katy represented CCHD’s NCHWTC, which will be involved in the WOW project by providing community-based, culturally competent outreach and promotion related to physical activity and healthy food environments. Ms. Paula Saldana and Ms. Dinorah Martinez, current NCHWTC staff who are state certified Community Health Workers (CHW) and CHW Instructors, will contribute to the WOW project in addition to three new CHW members who are expected to join the NCHWTC team within the next month.